The Bankruptcy and Insolvency Act ("BIA") (French: Loi sur la faillite et l'insolvabilité) (the Act) is one of the statutes that regulates the law on bankruptcy and insolvency in Canada. It governs bankruptcies, consumer and commercial proposals, and receiverships in Canada. It also governs the Office of the Superintendent of Bankruptcy, a federal agency responsible for ensuring that bankruptcies are administered in a fair and orderly manner. Canadian commercial insolvency law is not codified in one exhaustive statute. Instead, Parliament has enacted multiple insolvency statutes, the main one being the BIA. The BIA offers a self-contained legal regime providing for both reorganization and liquidation.... It is characterized by a rules-based approach to proceedings. The BIA is available to insolvent debtors owing $1000 or more, regardless of whether they are natural or legal persons. It contains mechanisms for debtors to make proposals to their creditors for the adjustment of debts. If a proposal fails, the BIA contains a bridge to bankruptcy whereby the debtor's assets are liquidated and the proceeds paid to creditors in accordance with the statutory scheme of distribution. The Farm Debt Mediation Act provides that farmers cannot be forced into bankruptcy, but they can make a voluntary assignment. The Companies' Creditors Arrangement Act provides that a court may order a stay of proceedings with respect to specified large debtors, whether or not they have already been initiated. where a proposal under the Act has failed. is acting under a court order made under any other federal or provincial statute that authorizes the appointment of a receiver or receiver-manager. Provision is also made for dealing with cross-border insolvencies and the recognition of foreign proceedings. the definition of terms such as "secured creditor", if defined under the Bankruptcy Act, must be interpreted in bankruptcy cases as defined by the federal Parliament, not the provincial legislatures. Provinces cannot affect how such terms are defined for purposes of the Act. in determining the relationship between provincial legislation and the Bankruptcy Act, the form of the provincial interest created must not be allowed to triumph over its substance. The provinces are not entitled to do indirectly what they are prohibited from doing directly. there need not be any provincial intention to intrude into the exclusive federal sphere of bankruptcy and to conflict with the order of priorities of the Bankruptcy Act in order to render the provincial law inapplicable. It is sufficient that the effect of provincial legislation is to do so. An Alberta Act was held neither to disqualify a person from driving a motor vehicle or to suspend the registration of such vehicles, because of an unsatisfied personal injury debt that had been discharged in bankruptcy. An Ontario Act governing the collection of tolls charged by 407 ETR was held not to apply to bar a discharged bankrupt from renewing his license plates upon payment of normal annual fees. However, a Saskatchewan Act that required creditors to serve a notice of intention, engage in mandatory mediation, and prove that the debtor has no reasonable possibility of meeting its obligations or is not making a sincere and reasonable effort to meet its obligations before it can begin an action with respect to farm land was held not to be inconsistent with the BIA, as cooperative federalism dictates that provincial legislative power should not be constrained, absent an actual inconsistency. No specific legislation on bankruptcy and insolvency previously existed in New Brunswick and Nova Scotia. A secured creditor cannot enforce security on the business assets of an insolvent person without having given 10 days' advance notice in the prescribed form and manner. No person may terminate or amend – or claim an accelerated payment or forfeiture of the term under – any agreement, including a security agreement, with a bankrupt individual by reason only of the individual's bankruptcy or insolvency. Similar provision is made with respect to any insolvent person upon filing a notice of intention or a proposal. A notice of intention, a Division I proposal, or a Division II proposal, will automatically create a stay of proceedings and "no creditor has any remedy against the debtor or the debtor's property, or shall commence or continue any action, execution or other proceedings, for the recovery of a claim provable in bankruptcy". Similar provision is also made on the bankruptcy of any debtor. Directors of insolvent companies that have filed a notice of intention or a proposal have similar protection. the rights of a secured creditor. The Ontario Court of Appeal has ruled that, in the case of a "requirement to pay" under the Income Tax Act (Canada) that was issued after a notice of application to appoint a receiver (but before the court heard the application), supported by an ex parte "jeopardy order" issued by the Federal Court of Canada under s. 225.1(1) of that Act, the "requirement to pay" was considered to have been completely executed on the date of its issue, and thus took precedence over other creditors' claims. The estate is then settled, using the priority of claims outlined in the BIA. As a consequence, the Supreme Court of Canada has ruled that direct payment clauses in contracts (allowing contractors to make payments to creditors of a bankrupt subcontractor) do not release the contractor from its obligations to the trustee of the estate. participation in the claims process does not preclude any other remedies creditors may have available. For example, guarantees may be called, with the guarantors having the subsequent right to make a claim against the estate for the amounts they were required to pay. Guarantees can normally be demanded by suppliers from officers and directors, and parent company guarantees are also common. Financial institutions, in order to fully realize on secured obligations of a debtor, will normally require guarantors to execute a "Guarantee and Postponement of Claim", which prevents the guarantor from filing a claim against the estate until the secured creditor has been paid in full. Every creditor must prove his claim and a creditor who does not prove his claim is not entitled to any distribution of the proceeds from bankrupt's estate. The claim must be delivered to the trustee in bankruptcy and the trustee in bankruptcy must examine every proof of claim and can request further proof. The trustee may disallow, in whole or in part, any claim of right to a priority under the BIA or security. Generally, the test of proving the claim before the trustee in bankruptcy is very low, and a claim is proved unless it is too "remote and speculative". The rationale for such a low test is to discharge as many claims as possible to allow the bankrupt to make a fresh start after the discharge. Creditors also have the ability, with the approval of the court, to take over a cause of action that the trustee has decided not to pursue. Discharge does not extinguish claims that are provable in bankruptcy. It releases the debtor from such claims, and creditors cease to be able to enforce them. any interest accrued with respect to any of the above debts. Directors and parties related to the bankrupt may still be held personally liable for certain tax debts, and, if a clearance certificate is not obtained from the tax authorities prior to discharge, directors' liability will subsequently resume. Directors can also be held accountable for other liabilities arising from bankruptcy, regulatory and other statutory offences. A trustee usually makes a claim under provincial fraudulent conveyance legislation at the same time as a s. 96 claim, in order to set aside the transfer. If valuable consideration has been given for the transfer, the trustee must prove that both the bankrupt and the transferee intended to defeat, hinder or delay the creditors. Recovery actions under ss. 95 and 96, as for other recovery actions with respect to collections, can only be initiated by the trustee, even when they may be of benefit only to a secured creditor (unless creditors seek court approval under s. 38 to pursue the matter directly). S. 95(2) provides that, where a preference is given, the fact that it may have been given under pressure is irrelevant. However, the courts have ruled that a payment may withstand challenge by a trustee where it is made in furtherance of a reasonable business imperative. in any other case, leave has been granted by a judge of the Court of Appeal (but such appeal is not as of right). Registrars of the provincial Superior Courts have significant powers in relation to procedural matters, unopposed proceedings and in other matters under the Act. The Office of the Superintendent of Bankruptcy ("OSB") is designed to supervise the administration of all estates and matters to which the Act applies. It grants licenses for the trustees in bankruptcy, inspects and/or investigates bankruptcy estates, reviews the conduct of the trustees in bankruptcy and the receivers, and examines trustee's accounts, receipts, disbursements and final statements. It has specific powers to intervene in any matter or proceeding in court as if the OSB were a party thereto, as well as to issue directives providing official interpretation of the bankruptcy process to the trustees in bankruptcy and the receivers. The trustee acts as receiver for all the estate's property, and is entitled to see its books and records. All moneys he receives must be deposited into a separate trust account. When required, he is obliged to report on the estate's condition, moneys on hand, and property remaining unsold. He is not obliged to continue the business of the bankrupt, where there is no good business case for doing so. When he has completed the duties required of him for administering the estate, he shall apply to the court for a discharge, but any interested person may file an objection to having the discharge take place. the absolute discharge of the bankrupt, without requiring him to pay to the estate the price agreed upon for the right to sell the property. At the first meeting of the creditors, up to five individuals may be appointed to be inspectors of the estate (except where the creditors decide that that is not necessary). No inspector may be appointed if he is a party to any contested action or proceeding against the estate. Where the value of an individual debtor's property is under $15,000, inspectors are not appointed (except where the creditors decide otherwise). The trustee is required to obtain the inspectors' permission before carrying out many of his responsibilities, such as the sale of property of the estate, the institution or defending of actions relating to the property of the bankrupt, settling any debts owing to the bankrupt and exercising trustee's discretion in retaining and assigning bankrupt's contracts. The inspectors must give their approval to the final statement of receipts and disbursements and trustee's fees. Inspectors have a fiduciary duty to the creditors and should be impartial though acting in their interest. They should supervise the trustee's compliance with the Act and the Superintendent's directives, and may apply for the removal of the trustee. The receiver must do what "practicality demands" to preserve the assets  and must not go beyond what is necessary in the circumstances. In the first case, the applicant must give an undertaking with respect to the debtor's legal rights, and to damages in the event of the application being dismissed. The interim receiver can take conservatory measures and dispose of perishable property in order to comply with the order of the court, but the receiver cannot otherwise unduly interfere with the bankrupt in the carrying on of the debtor's business. In the latter two cases, the court can only make the appointment if it is shown that it is necessary for the protection of the debtor's estate, or in the interest of the creditor(s). ^ "BIA, S. 2, definition of "person"". ^ Martin Boodman (November 29, 2010). "Who Owns a Quebec Partnership?". McCarthy Tétrault. ^ Alexandra Popovici (2013). "Québec's Partnership: Une Société Distincte". Journal of Civil Law Studies. Louisiana State University Law Center. 6 (1): 339–372. Retrieved 11 November 2013. ^ "BIA, S. 2, definition of "corporation"". ^ "Winding-Up and Restructuring Act, S. 6(1)". 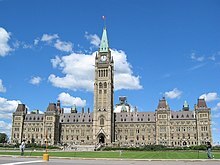 ^ "Canada Transportation Act, S. 106". ^ "Farm Debt Mediation Act, SS. 12-13". ^ "Farm Debt Mediation Act, S. 14". ^ Mastrangelo, John (November 23, 2015). "Paramountcy Problems in Alberta (Attorney General) v Moloney". thecourt.ca. Osgoode Hall Law School. Archived from the original on 2016-01-31. Retrieved 2016-01-25. ^ Mastrangelo, John (January 2, 2016). "Paramountcy Problems Part II – Narrowing 'Federal Purpose' in Saskatchewan (Attorney General) v Lemare Lake Logging". thecourt.ca. Osgoode Hall Law School. Archived from the original on 2016-01-31. Retrieved 2016-01-25. ^ James D. Edgar (1864). The Insolvent act of 1864: with tariff, notes, forms and a full index. Rollo & Adam (Toronto). Retrieved 2011-11-16. ^ John Popham (1870). The Insolvent Act of 1869: with notes and decisions of the courts of Ontario. Dawson Brothers (Montreal). Retrieved 2011-11-16. ^ Ivan Wotherspoon (1875). The Insolvent act of 1875: with the rules of practice and tariffs of fees in the different provinces of the Dominion. Dawson Brothers (Montreal). Retrieved 2011-11-16. ^ "Debtors and Creditors sharing the burden" (PDF). Senate Committee on Banking, Trade and Commerce, Parliament of Canada. November 2003. Retrieved 2011-11-16. ^ "BIA, S. 2, definition of "insolvent person"". ^ "BIA, S. 2, definition of "bankrupt"". ^ "BIA, S. 2, definition of "debtor"". ^ "BIA, S. 2, definition of "creditor"". ^ "Income Tax Act, R.S.C., 1985, c. 1 (5th Supp. ), s. 225.1(1)". ^ "Canada Revenue Agency Trumps Unsecured Creditors!". Weir Foulds LLP. October 2010. ^ "Case Comment – Re I. Waxman & Sons Ltd". Cassels Brock. 14 October 2010. ^ Wood, Roderick J. (2010). "Subordination Agreements, Bankruptcy and the PPSA" (PDF). Canadian Business Law Journal. 49 (1): 66–98. SSRN 1715587. ^ "BIA, SS. 137, 139, 140". ^ Eleonore Morris (2012-11-26). "All is not lost if a limitations period missed". Cassels Brock. Retrieved 2013-06-22. ^ such as "Guarantee and Postponement of Claim" (PDF). Royal Bank of Canada. Retrieved March 22, 2017. ^ Katherine M. Wellburn and Murray Jamieson (2008). "Taking it all away – Traps set for debtors trying to dodge the taxman" (PDF). Retrieved 2011-08-25. ^ Jean-Guillaume Shooner (September 29, 2014). "GST/QST – A tax debtor's bankruptcy or arrangement does not extinguish the obligation to obtain a clearance certificate from a tax authority". Stikeman Elliott. , discussing Congiu c. Canada 2014 CAF 73 (19 March 2014), Federal Court of Appeal (Canada)(in French) and Congiu c. Agence du revenu du Québec 2014 QCCA 242 (7 February 2014), Court of Appeal (Quebec, Canada)(in French). Leave to appeal dismissed with costs, Rita Congiu c. Agence du revenu du Québec 2014 CanLII 51415 (4 September 2014). ^ David A. DeGroot (June 2009). "Directors' liability during corporate insolvency" (PDF). Burnett, Duckworth & Palmer LLP. Retrieved 2011-09-04. ^ Camelino & Shea 2013, pp. 33–37. ^ e.g., "Assignments and Preferences Act (Ontario), R.S.O. 1990, c. A.33". Retrieved 2011-09-13. ^ e.g., "Fraudulent Conveyances Act (Ontario), R.S.O. 1990, c. F.29". ^ Michael Nowina; Shaheen Karolia (November 18, 2011). "Clarifying preference actions' place". The Lawyers Weekly: 16. Retrieved 18 November 2013. ^ Waël Rostom; Jeffrey Levine; Stephen Eddy (December 2013). "Preferential Payments: Commercial Imperative Or Creditor Pressure?". McMillan LLP. ^ Ian Aversa (May 23, 2013). "Business Development Bank of Canada v. Pine Tree Resorts Inc. and 1212360 Ontario Limited: A Unified Test for Granting Leave to Appeal under Section 193(e) of the BIA" (PDF). Aird & Berlis. ^ "Office of Superintendent in Bankruptcy website". ^ "Bankruptcy and Insolvency General Rules (C.R.C., c. 368), S. 130". ^ Aubrey E. Kauffman; R. Graham Phoenix (2007-10-31). "Interim receivers under the BIA: What practicality demands... for now" (PDF). Fasken Martineau. Retrieved 2012-12-11. Gustavo F. Camelino; E. Patrick Shea, eds. (2013). Insolvency Law: Current Topics in Bankruptcy and Insolvency. Toronto: Ontario Bar Association, Institute 2013. ISBN 978-1-77060-179-6.